Underground cities in America…crazy conjecture? Conspiracy theorists claim the US Government is building underground cities in preparation for a coming catastrophe they seem certain is imminent. Whether it will be some kind of nuclear apocalypse or a religious, Armageddon-type scenario, nobody knows. At least, nobody we know knows. In episode 4 of the third season of Conspiracy Theory with Jesse Ventura, former Minnesota Governor Ventura and his son Tyrel Ventura, along with Sean Stone, son of Oscar-winning filmmaker Oliver Stone, travel to the Ozarks, that mountainous region of the central United States, to investigate rumors of underground developments there. They find the entrance to what appears to be an underground city being built inside a mountain. Jesse Ventura (center) and team outside what they call an underground city. It does raise the question, what is happening below ground? 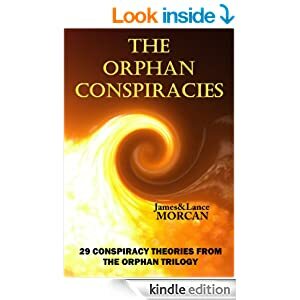 We address this very question in our book THE ORPHAN CONSPIRACIES: 29 Conspiracy Theories from The Orphan Trilogy. There’s a long list of claims regarding the nefarious activities conducted by the global elite and their pawns in these underground bases. Some say they have clandestine prisons where officially designated missing persons and others who have dropped off the grid are held captive; some believe human-alien joint ventures are taking place in these bases to further black technologies or to advance certain species. When it comes to suppressed science, the hit sci-fi television seriesWarehouse 13, which at the time of writing is still on TV and into its fifth season, probably best portrays the secret science bunker concept. The basic plot has two US Secret Service Agents assigned to a top-secret government warehouse to protect scientific discoveries and radical technologies invented by Nikola Tesla and others – none of which the public are aware. The premise of a largely underground warehouse storing suppressed discoveries and inventions is based on conspiracy theories that have been swirling around for decades. Hit TV series taps into theory. There have also been reports from former military engineers and government geologists about supersonic transportation systems underground. Who knows, maybe the global elite travel between cities and countries below ground, utilizing the underworld’s rumored faster transportation methods? It has also been claimed that radical biological experiments take place in the Splinter Civilization’s underworld. The kind that the laws of the land above ground don’t allow – such as unsanctioned forms of genetic engineering, human cloning and illegal drug testing by pharmaceutical corporations. Some conspiracy theorists who believe complex viruses like HIV/AIDS, SARS and Ebola are all manmade, have even theorized that these viruses are manufactured and tested in underground facilities before being unleashed above ground. Neo-Nazi technologies are also said to exist below ground. This apparently dates back to the Project Paperclip scientists who, as we mention in chapter 12, were secretly ushered in to America immediately after WW2. Werner von Braun, the German-turned naturalized American and Godfather of NASA’s space rocket program, is one that many researchers have named in relation to underground bases. These Nazi Paperclip scientists were supposedly crucial to the development and construction of the underground bases and tunnels that now exist beneath American soil. Aircraft and God knows what else stored underground…somewhere. (Photo not verified). Wildest of all, are the numerous conspiracy theories that maintain many of these underground bases – of which there are rumored to be thousands worldwide – are full of captive men, women and children. Some suggest the captives may have been taken from above ground, which may partially account for the hundreds of thousands of missing persons reported annually around the world who are never found; others suggest the captives are human clones designed to spend their lives enslaved underground to further the global elite’s agendas; and still others suggest some captives are used as human guinea pigs in radical science experiments conducted by scientists working for the Splinter Civilization. And then there’s the intriguing statements made by one Philip Schneider, an American geologist who, until his untimely death, also claimed to be an ex-government military engineer.Schneider said while he was involved in constructing additional bunkers in one underground base in New Mexico, he discovered aliens conducted horrific experiments on people detained in bunkers miles below the earth’s surface. (More on Schneider later in this chapter). Not all is what it seems.